Oaklands Park is in the city of Victoria, B.C., one of thirteen communities that forms the Capital Regional District of British Columbia. There is plenty of space and things to do at Oaklands Park. Nearly two and half hectares of space to stretch, run, and throw a ball or frisbee. There is a very nice baseball field and tennis courts. The ball field is one of the fields used by the National Little League based out of Hillside Park. The playground is great for kids of all ages. It seems to have two section as it is divided by a short concrete wall. This wall is a good width to use as a balance beam for budding gymnasts. There are swings for toddlers and climbing equipment that is suitable for smaller sizes too. The second set of climbing equipment is for bigger kids and also includes swings. The play area has a separate sand pit so bring shovels and containers. The picnic tables and benches make it a great place to be outdoors for extended periods. And there are toilets near the building on the other side of the ball diamonds. At the south side of the park are tennis courts with additional markings for those who also enjoy pickle ball. The Garry oak trees Quercus garryana are scattered sparingly throughout Oaklands Park. 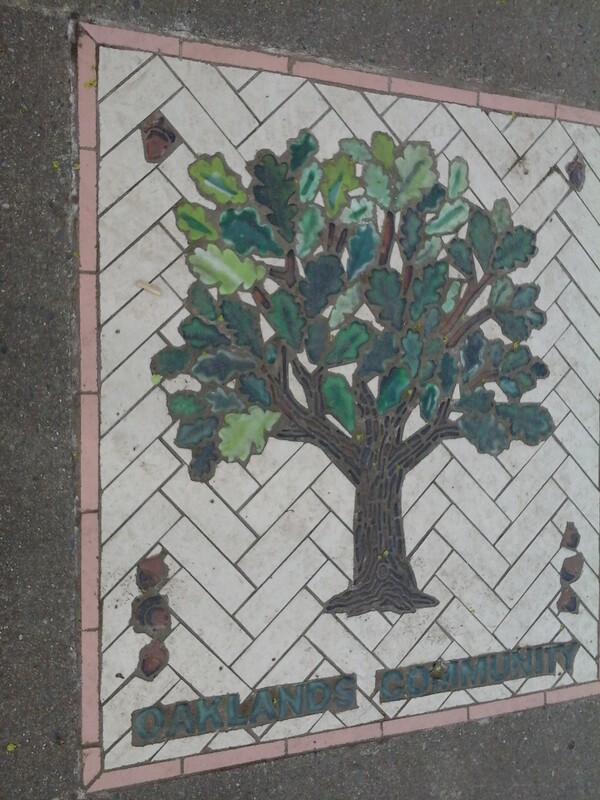 A colorful oak tree mosaic near the entrance on Ryan Street greets park attendees. David Spencer Park is about one block west along Ryan Street. The Shelbourne Street Green Space is about two block to the east along Ryan Street. Oakland Park can be reached from the Trans Canada Highway becomes Douglas Street in the City of Victoria. Turn east onto Hillside Avenue and continue to Belmont Avenue. Continue past Oaklands Elementary School Green Space. Turn south on Belmont then left onto Ryan Street. The park is on the corner of Ryan and Forbes Streets. There is parking for the ball field along King Street. There is limited roadside parking in the rest of neighboring street. A bus travels along Hillside Avenue from downtown to the University of Victoria, which makes it about a two block walk to this park.